Clothes: Everything I wear is pretty much maternity now. Tanya gave me even more clothes & I've been rocking dresses & super comfy shorts my mom got me! Sleep: Sleep is the same still. I wake up so often to use the restroom I don't even think about it anymore. I also will still have some nights that I will wake up and be up for 1-2 hours just tossing and turning while my mind runs wild. Cravings/Aversions: Chocolate anything really ;) I've really had to calm it down with how Much dessert food I was having. I didn't say I would cut it out.. Just that I'll limit myself to one brownie instead of 2 .. And by 2 I mean 4. I've also been eating a ton of strawberries & frozen organic soft pretzels. Oh! And I saw an advertisement for chilis chips and salsa & I reaaaalllly almost made Nathan take me at 10 at night .. (I like to dip the chip in ranch then in the salsa, please don't judge me) but don't worry I settled for store bought chips and deli salsa. It's all good. Baby- Little girl is doing good! She is about the size of a pomegranate at 10.5 inches and 12 (ish) ounces. It's so crazy that's she's getting so big & will almost weigh a pound! It's really starting to sink in that there is a tiny human in my belly!! Movement: This girl is a mover! Despite finding out I have an anterior placenta, she has been moving so much lately! One day she moved so much I only didn't feel her moving every couple hours but for the most part it was pretty consistent and I loved it! She has also started to kick back when I put the stethoscope on my belly (although she did this a couple times in the past too!) and she will kick me if am am sitting hunched over so I tend to do that to get her to move if I want to ;) How I am feeling: SO GREAT! Can we talk about how different the second trimester is?! I never thought I would see the day again where I enjoyed grocery shopping, meal planning, budgeting & cleaning again! I have so much energy & I want to do everything. I've actually been enjoying cleaning & spent a day off just getting stuff done & it was fun to me haha! It's why I think I was fine with doing another post this week.. I also realized I was trying to hard with the chalkboard so I got less crazy so I could stay more motivated ;) I am soaking it in because I know I may get uncomfortable come the third trimester. How Daddy's feeling: "I'm excited to paint her room & get everything around the house finished." Other Stuff: I cannot stop shopping for this sweet girl. It's probably getting out of hand but baby girl stuff is just so cute! Last week I got some stuff at JCPennys and later that night Nathan and I went out and got her even more at Kohls. I was also in Payson this last weekend and found an amazing deal on a white changing table that matches her crib! My sister actually used to have the same one & loved it! It is so well made with tons of storage and I got a smokin' deal! Check out my other Pregnancy related posts! Becoming Parents 19 & 20 Week 'Bumpdate' 17 & 18 Week 'Bumpdate' 16 Week 'Bumpdate' 14 & 15 Week 'Bumpdate' 13 Week 'Bumpdate' 0-12 Weeks 'Bumpdate' Pregnancy Announcement If you want to see more of the bump, let's be friends on Instagram! 20 weeks!- Belly is definitely filling out! Weight: After my weigh in at the Doctors I am up 10 pounds since the very first time I weighed in. Apparently 7 of those pounds happened in the last month so my Dr. told me to slow down a bit with desserts. This was after I wouldn't answer her when she asked what my dessert eating habits were ;) Symptoms: Leg cramps and random, consistent cramping still. Dr said either from holding bladder too long, dehydrated, or just growing because there is no other concern with it. I was drinking 75 ounces, (which is still a lot of water!) a day and she said I might as well up it to a full gallon which I started. This has helped tremendously! I haven't had them week 20 like week 19! I have been a little more emotional and crying over things like not being able to return something at Kohls, ha ha! I also get really emotional with our students lately about some of them graduating or when talking to them about the things they're going through. Dr. Appt: We found out from our anatomy scan that my placenta is anterior. All this means is it might be a little harder for me to feel baby but I have been feeling her since 13 weeks. It just seems to be pretty sporadic .. I can go a day or two without feeling much but then get kicked a bunch :) Dr said Ultrasound was great though so we will just do another at 36 weeks, if everything stays good, to see how big she is. Got a breast pump prescription which I think is cool! Baby's heartbeat was 152.. it's always been above 150. Sleep: I still love sleeping but have been ok with just 8 hours and can stand to stay up a little later some nights. Since my increase in water.. I literally go to the bathroom 6 times a night if not more. It's bad. I still wake up with hip pain some nights and have a rough time falling back asleep but it's been pretty good. Cravings/Aversions: Cravings: Grilled cheese sandwiches, brownies, laffy taffys and burgers. Apparently I like bad food. I haven't had many aversions lately which is awesome! But I have noticed I don't like things that I used to love.. like Starbucks or Bean & Cheese Burros. I've also noticed if I still don't eat every 2 to 3 hours, I get pretty nauseous until I've eaten. After what my dr said, I have been good about only allowing myself 300 extra calories a day.. but its stressing me out to calculate it. To be honest.. If I made "healthier choices" I wouldn't need to count anything.. but I have a rough time resisting a cookie (or butterfinger, or brownie) once a day... Baby- Baby is doing good! As I said, our anatomy scan went great and she is growing perfectly. She now measures from feet to top of head when in the past she was measured from rump to head. She's the size of a banana and weighs about 10.6 ounces. Check out my other Pregnancy related posts! Becoming Parents 17 & 18 Week 'Bumpdate' 16 Week 'Bumpdate' 14 & 15 Week 'Bumpdate' 13 Week 'Bumpdate' 0-12 Weeks 'Bumpdate' Pregnancy Announcement If you want to see more of the bump, let's be friends on Instagram! 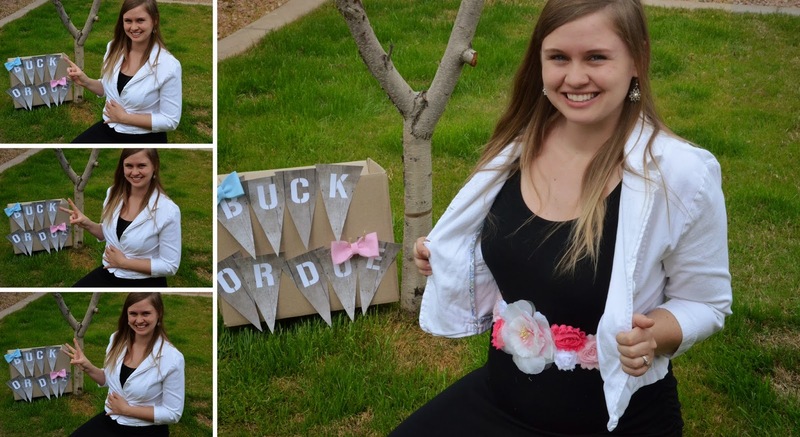 I first fell in love with Mandi's shop when I stumbled across her Maternity Sash's on Etsy. 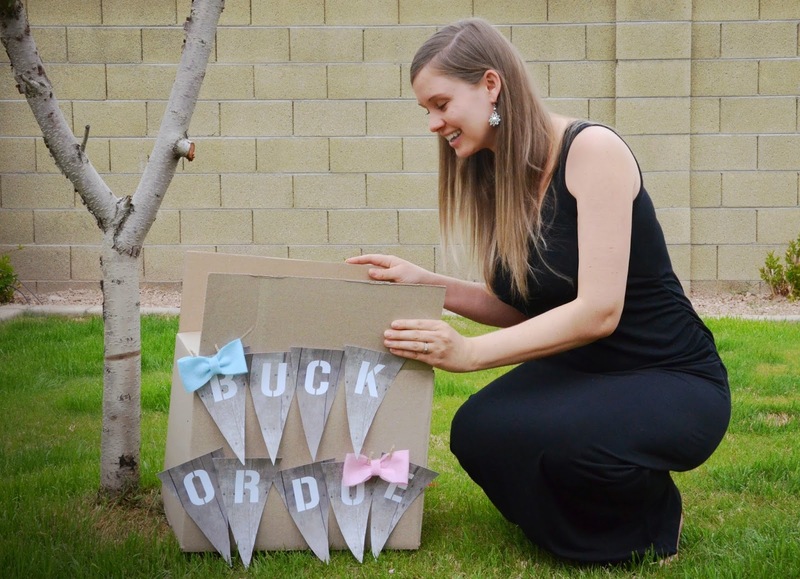 I honestly had never seen anything like it used before for maternity photos or a gender reveal and I loved how each one was made special and to the color of the gender. 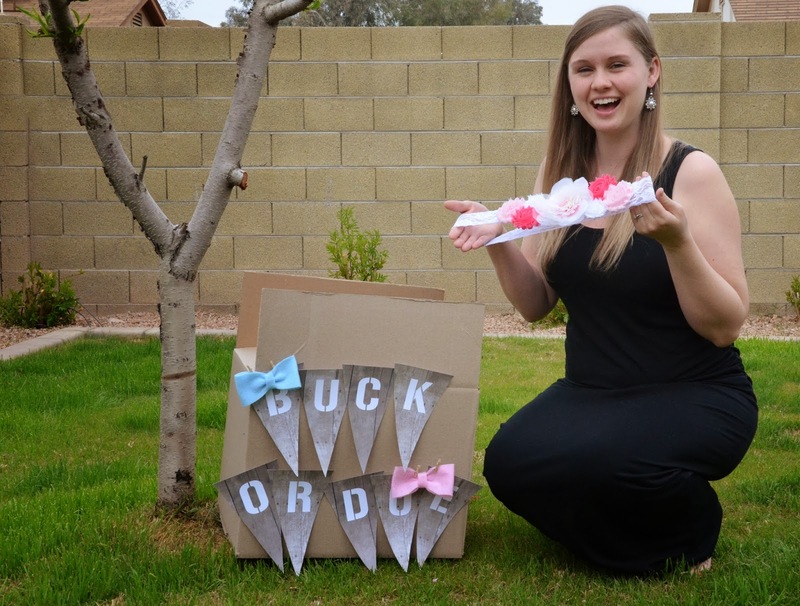 After looking through tons of her photos I noticed she even made one that was pink AND blue which I thought would be so special to wear at a gender Reveal Party! Mandi sent me a pink one, because duh, it's a girl!! She also was the first to know besides my husband and I :) When I got it in the mail I was so excited to open it. She had made a new one especially for me and it was beautiful. She included a sweet little note and it was wrapped perfectly without any creases. I've honestly worn it a ton of times. I used it for an impromptu photo shoot of revealing the baby's gender & I also wore it around with a cute dress to show it off. I even wore it to church the Sunday after the reveal so we could use it to tell others the gender. I got SO many compliments on how pretty it was and how unique of a product it is. Each little flower is a different shade of pink and the back has soft cloth pieces protecting your belly from the back part of the flower that might be scratchy. It's held together with a pretty white piece of lace that fit me perfectly because she measured it to fit ME specifically. I plan on using it for some of our maternity pictures down the road and am so so happy with it. I cannot express my gratitude enough for Mandi and her sweet little shop. 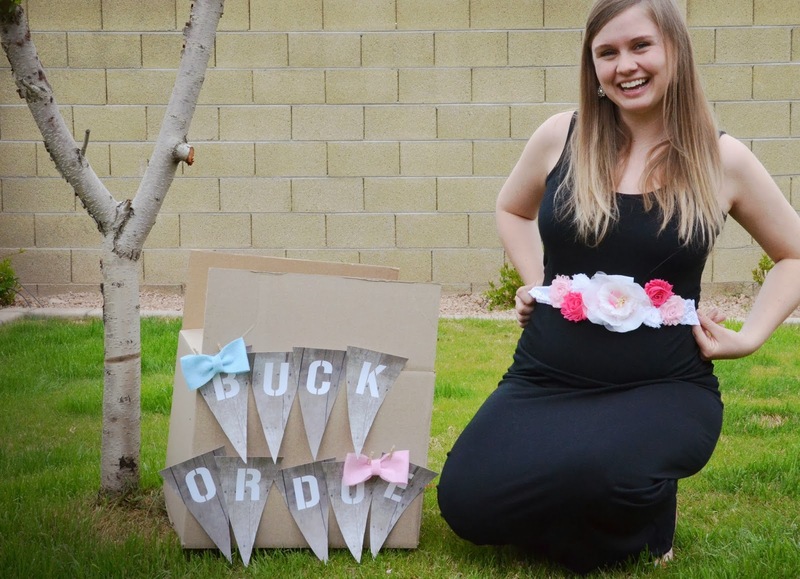 If you ever decide to get a maternity sash for a reveal, fun accessory or maternity pictures, I know you will be just as happy as I am! 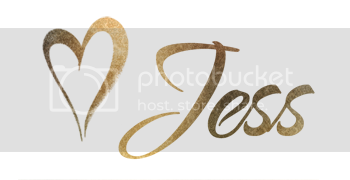 You can check out Mandi's shop, The Shabby Flower Boutique, here! *i was given this item in exchange for photos & a maternity sash. all opinions are my own.